We start Day 3 with a nice buffet breakfast in the Sheraton hotel. If we are to “have lunch on our own”, we try to grab stuff to make our own lunch, but today lunch in on GCT. 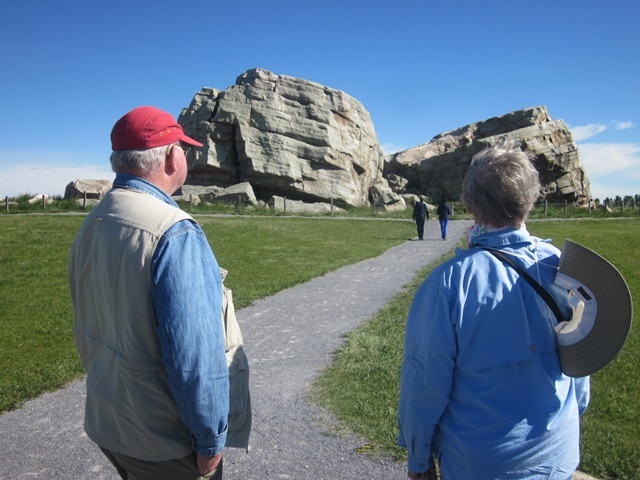 On the way, we stopped to look at a glacial erratic: The Okotoks Erratic AKA “The Big Rock”. It is a rock transported far from its place of origin by glacial ice. The Erratic weighs an estimated 16,500 tons. It measures about 30 feet high, 120 feet long and 60 feet wide. 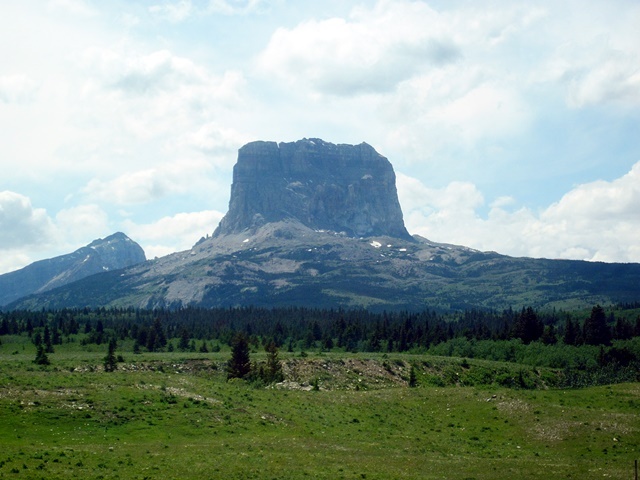 The rock has broken into pieces, but is still a large enough landmark on the flat prairie to have it’s own name. (Note: It’s a lovely day!! Tucked at the base base of the Big Rock was a Wild Rose. This is the official Alberta Provincial flower. 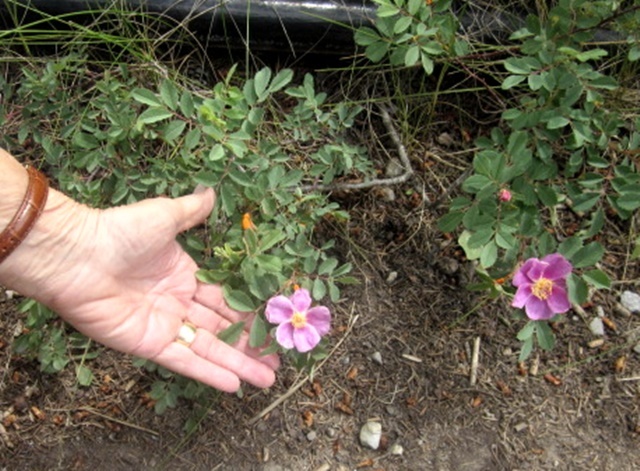 It looked a bit like our New England wild Beach Roses. 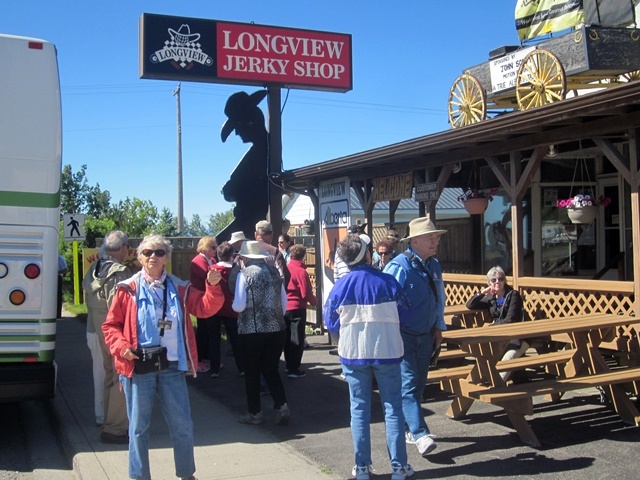 We made a quick “Potty Stop” at a Jerky Shop in Longview, AB. Many people bought some. Mary Ann and I had a sample of a real spicy jerky. I’d had enough with that! After getting lost on the only highway for miles, we finally found the Sierra West Ranch and Restaurant. It was off the main road, but it was a real neat place for lunch. Our hosts were Randy & Ginny Donahue. 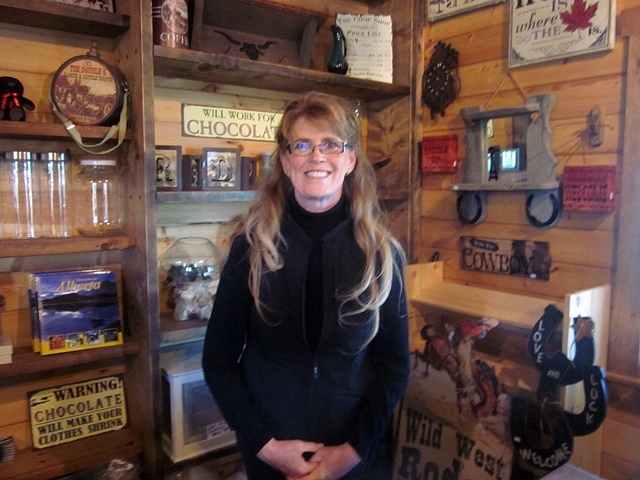 Both have been born in southwestern Alberta and raised with the ranching way of life. Real nice folks! Randy cooked the beef. 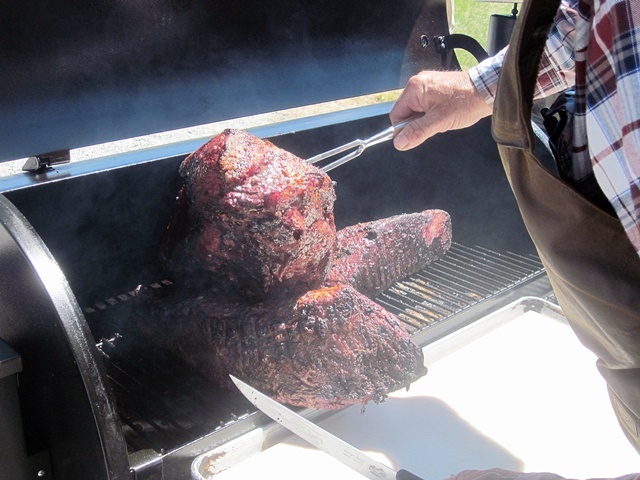 It looked like the whole cow. 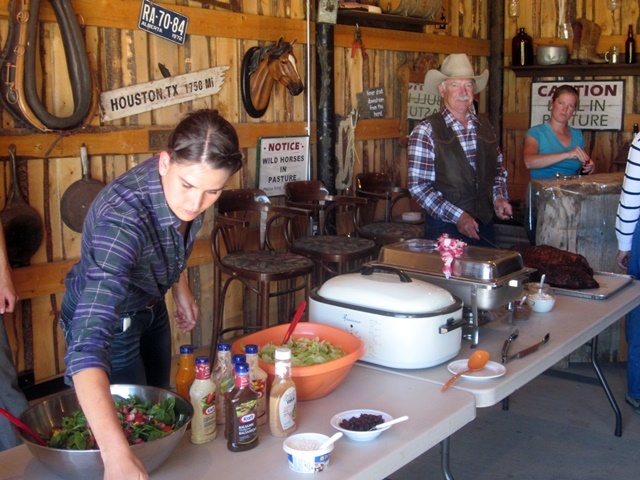 Randy and helpers served the beef, baked beans (secret receipe), salad , and “fixins'” in the barn. All you could eat! 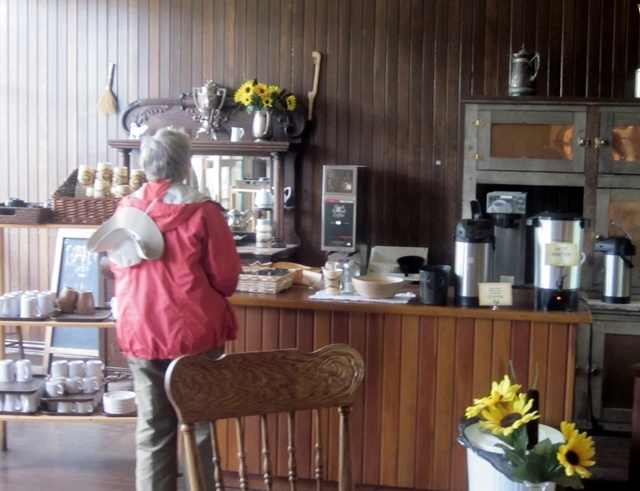 Ginny tended the General Store. 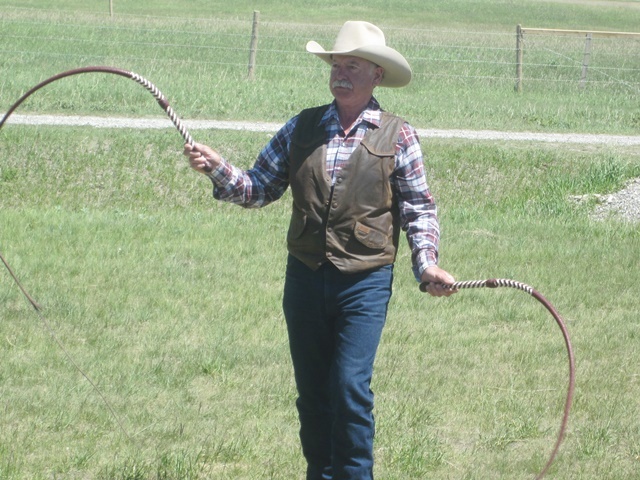 As a final treat, Randy gave a demonstration of bull whip cracking. I asked if he could snap a cigarette out of Mary Ann lips, but he declined to try. 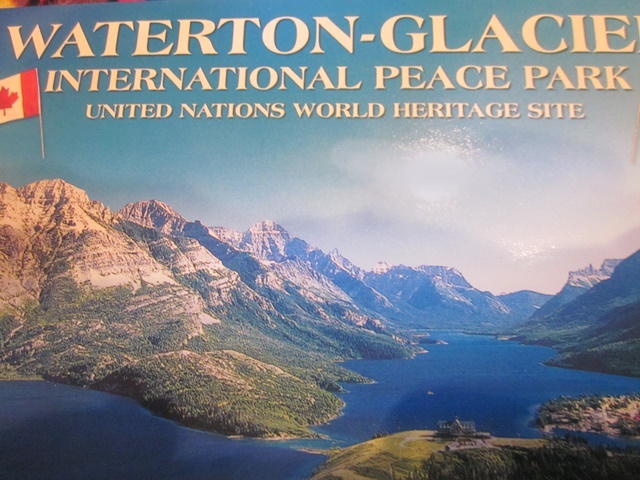 We continued on to Waterton Lakes where some of our group took a lake excursion. (Excursion means a GCT “Extra Cost Activity”.) Mary Ann and I had pizza and wine “on our own” for dinner. We ended Day 3 with a good nights sleep at the lodge. 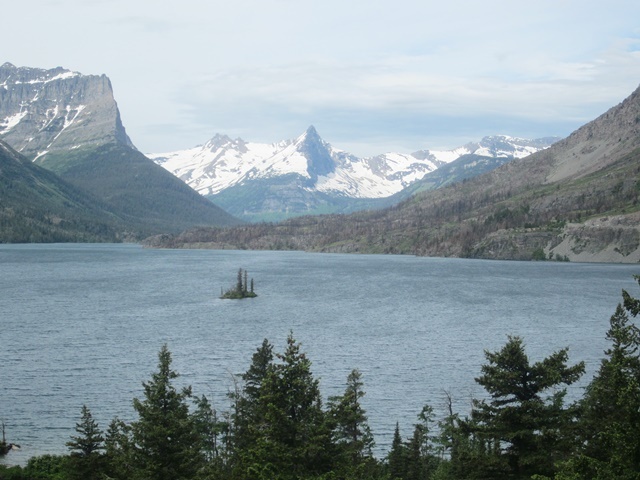 Day 4 was to be a trip back to the USA to visit Glacier National Park in Montana. In the morning after another buffet breakfast (no ketchup for the scrambled eggs) and some coffee, we took off for Montana. 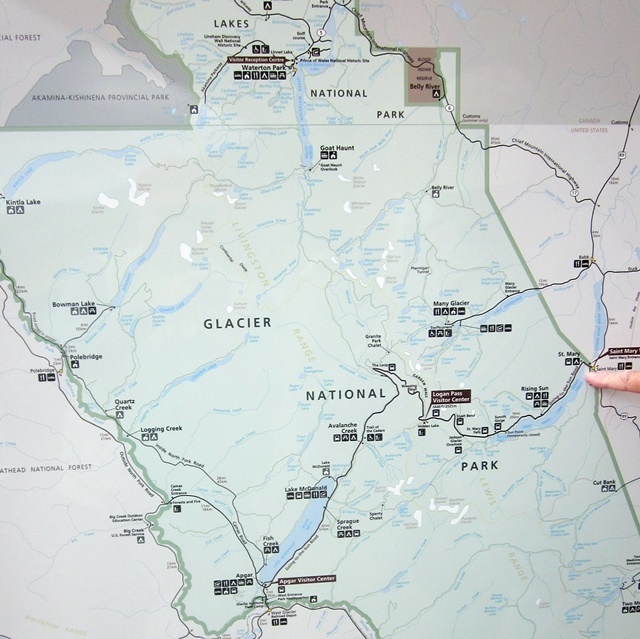 The map below shows Waterton Lakes at the top and St. Mary on the right (note the pointing finger). It was a 27 mile trip. We had to clear customs at the border. Both ways. Saint Mary Lake is the second largest lake in Glacier National Park, in the U. S. state of Montana. Located on the east side of the park, the Going-to-the-Sun Road parallels the lake along its north shore. At an altitude of 4,484 feet, Saint Mary Lake’s waters are colder and lie almost 1,500 feet higher in altitude than Lake McDonald, the largest lake in the park, which is located on the west side of the Continental Divide. The lake is 9.9 miles long and 300 feet deep with a surface area of 3,923 acres . The waters of the lake rarely rise above 50 °F and are home to various species of trout. During the winter, the lake is often completely frozen over with ice up to 4 feet thick. We took a smaller bus up the Going-to-the-Sun Road as far as we could go. We were blocked by snow, ice, and construction. 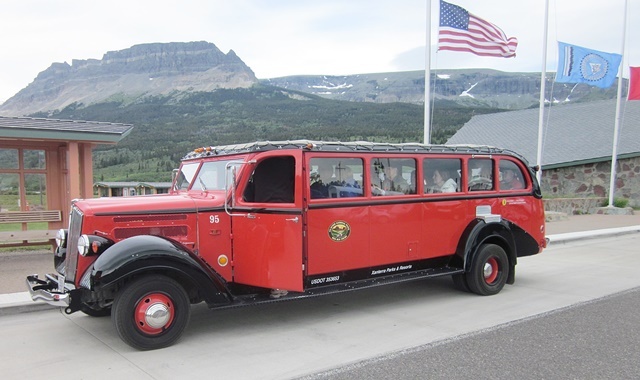 This is a picture of the “official” Glacier Park bus. Ours was not like this one. We stopped to look at the results of the 4,311-acre Reynolds Creek fire. This could be the Jackson Glacier above the western end of St Mary Lake? 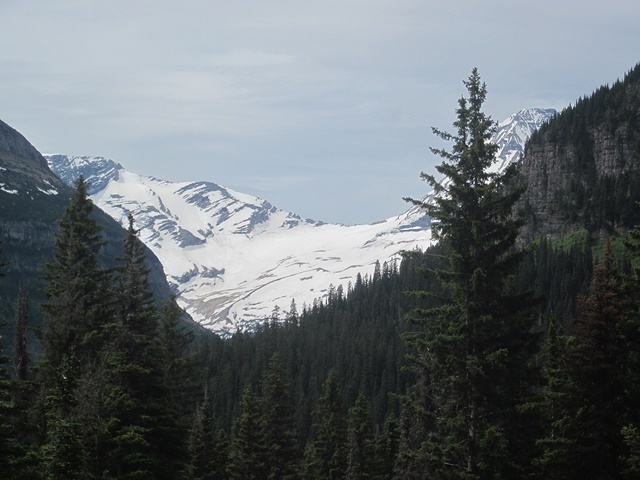 This is another glacier on the Going to the Sun Road. When I was 12 years old, My family took this road all the way to its western end. I recall making and throwing snow balls at Logan Pass, This pass (elevation 6,646 ft) is located along the Continental Divide. It is the highest point on the Going-to-the-Sun Road. The glaciers are melting a such a rapid rate that estimates are that they will be gone by 2030. Ice fields will remain, but moving glaciers will be gone. 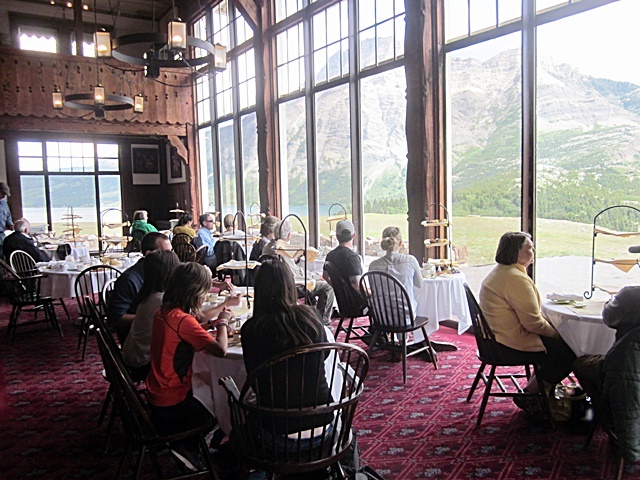 Before leaving Glacier, we had lunch (on our own) in the lunch room of the St Mary Lodge. On the way back to Waterton Lake we passed this ancient eroded volcano core. 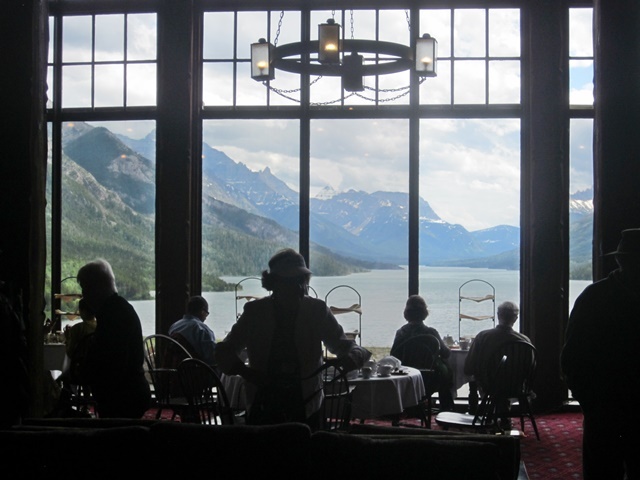 We returned to Waterton Lakes and stopped at the Prince of Wales (POW) hotel which sits above Waterton Lake and Town. Constructed between 1926 and 1927, the hotel was built by the American Great Northern Railway to lure American tourists north of the border during the prohibition era. 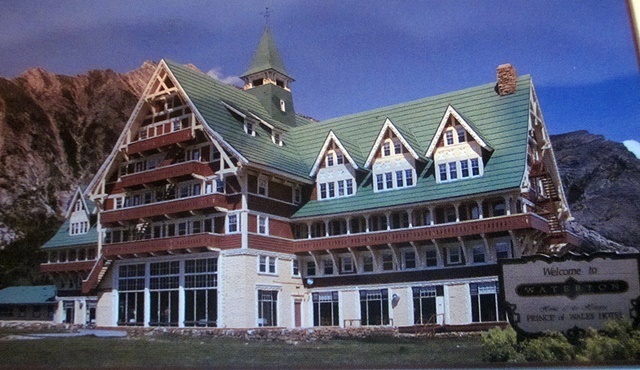 The hotel was named after the Prince of Wales (later King Edward VIII), in a transparent attempt to entice him to stay in the hotel on his 1927 Canadian tour, but the Prince stayed at a nearby ranch instead. This is the view from the dining room of the POW hotel. High Tea was in progress at the POW hotel. 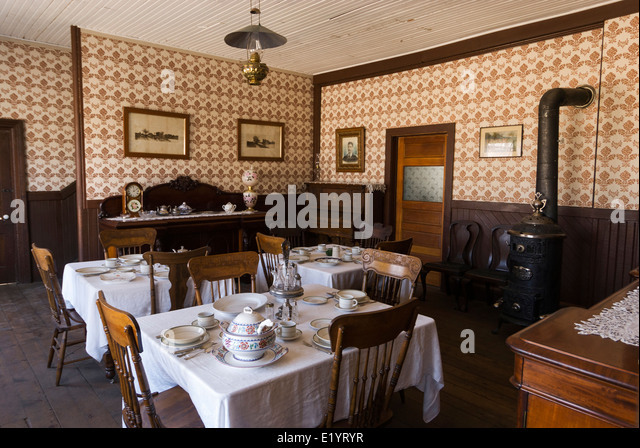 It cost $30 Cdn for tea and scones. We skipped it! Here is an aerial shot of the lake and town. Note the town and POW hotel in the lower right. Very pretty spot, indeed! 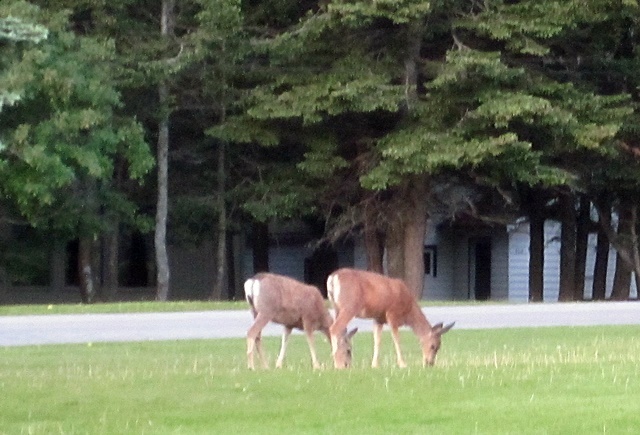 We were treated to deer feeding on our lawn at the lodge. Another evening of an “on your own” dinner. Mary Ann and I had snacks and wine in our room. We stopped to look at the Frank landslide on Turtle mountain. 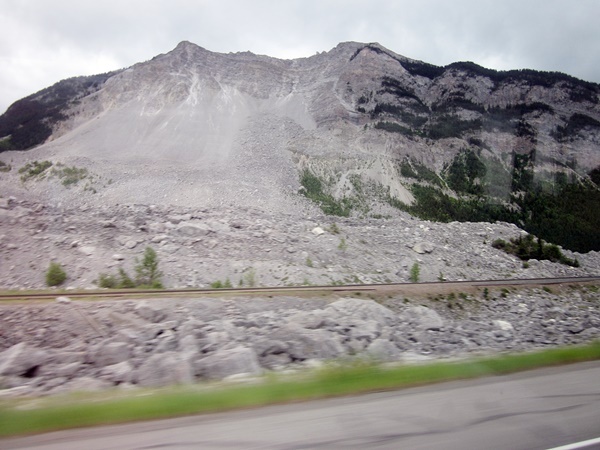 The Frank Slide was a rock slide that buried part of the mining town of Frank, Alberta, Canada. The incident occurred at 4:10 am on April 29, 1903. 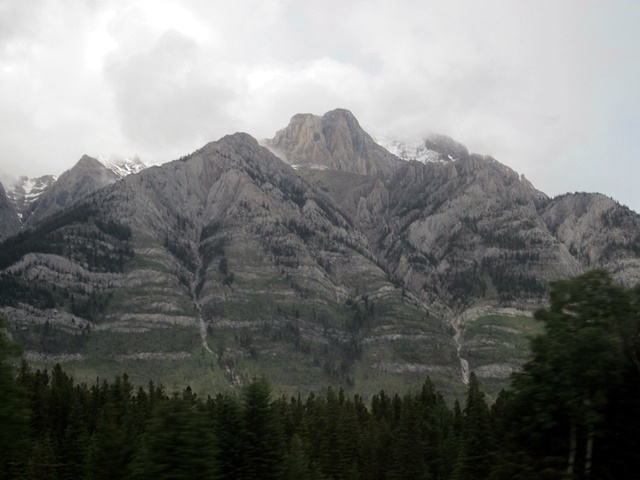 Over 90 million tons of limestone rock slid down Turtle Mountain within 100 seconds, obliterating the eastern edge of the town of Frank, the Canadian Pacific Railway line and the coal mine. It was one of the largest landslides in Canadian history and remains the deadliest, as between 70 and 90 of the town’s residents were killed, most of whom remain buried in the rubble. 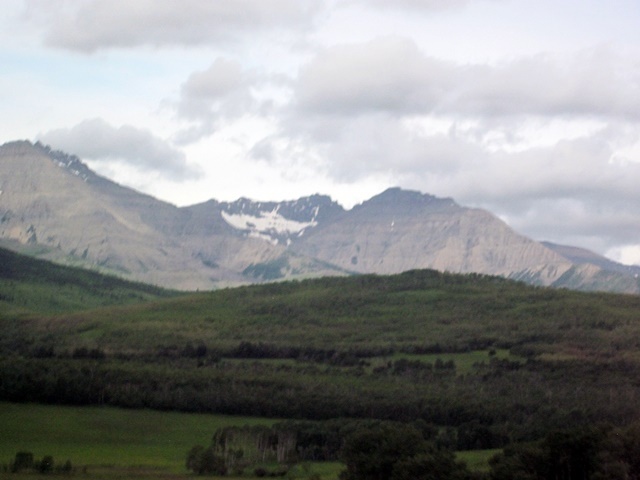 Multiple factors led to the slide: Turtle Mountain’s formation left it in a constant state of instability. Coal mining operations may have weakened the mountain’s internal structure, as did a wet winter and cold snap on the night of the disaster. The railway was repaired within three weeks and the coal mine was quickly reopened. The section of town closest to the mountain was relocated in 1911 amid fears that another slide was possible. The town’s population nearly doubled its pre-slide population by 1906, but dwindled after the mine closed permanently in 1917. The community is now part of the Municipality of Crowsnest Pass in the Province of Alberta and has a population around 200. 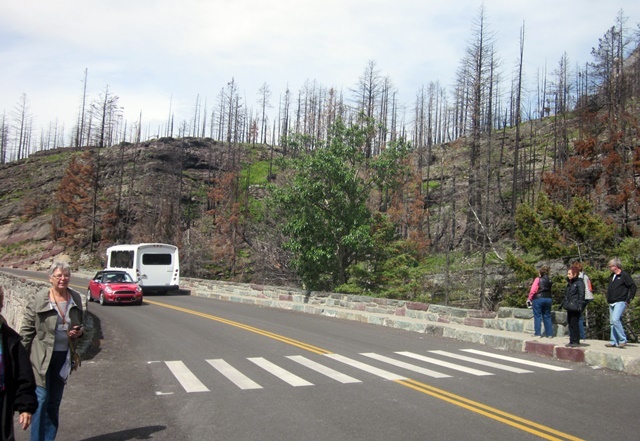 The site of the disaster, which remains nearly unchanged since the slide, is now a popular tourist destination. 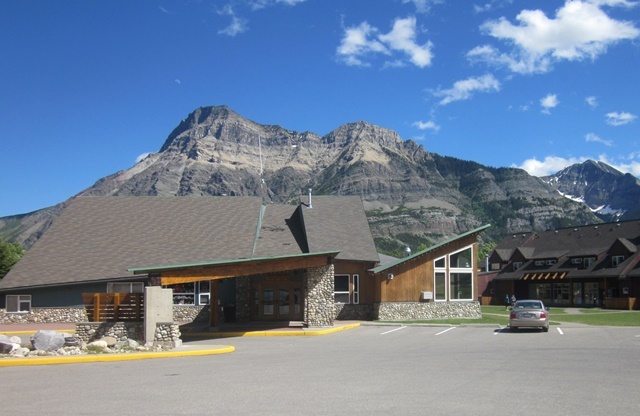 It has been designated a Provincial Historic Site of Alberta and is home to an interpretive center that receives over 100,000 visitors annually. The lunch room is one of these buildings. Note the mountains in the background. The origin of Fort Steele is closely linked to the discovery of gold on nearby Wild Horse Creek in the 1860s. The gold rush peaked in 1865 when an estimated 5,000 prospectors flooded into Fisherville combing the hills in search of their fortune. The gold strike was rich, as many men reportedly earned from $40,000 to $60,000 that summer. By the fall of 1865 the rich and easy-to-access gold diggings close to the surface were largely depleted. To make a profit, miners had to invest money in shafts or hydraulic equipment. Interested only in the quick profits of a new strike, most of the 5,000 miners moved on in search of better prospects. n 1888 things were fairly quiet at Fort Steele until 1892 when major deposits of silver, lead, and coal were discovered nearby. Prospectors flooded the Valley once more and the hills were dotted with campfires each evening. Fort Steele became the regions commercial, social, and administrative center and quickly grew to over 1,000 people. The boom at Fort Steele began to slow in 1899. Finally, in 1904, the Provincial government offices were moved to Cranbrook and by 1910 Fort Steele was in a state of sharp decline. 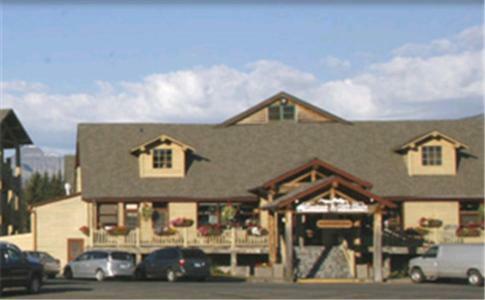 Today, Fort Steele Heritage Town is one of the most important attractions of its kind in British Columbia with over 80,000 people visiting each year. Here is where we had lunch. Kinda cute! Good sandwich! This was our pretty waitress in the Cafe where we had a nice lunch “on our own”. 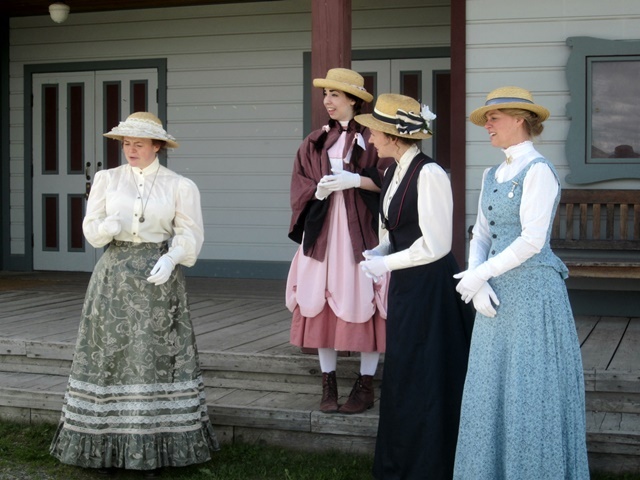 Here are some of the lovely ladies that take part in the skits at the opera house. No, alas,we didn’t have time for the show.